If you're still using the earlier versions of Windows then you may thought creating or changing a password in Windows 8 is same as previous versions. But those who are working with Windows 8 know that this is not same at all. When you are installing Windows 8 for the first time then you can set a password at the end of the installation process. If you skip that step during the time of installation then you will have to set it from the PC settings. In earlier versions of Windows password can be managed from a control panel item named User Accounts. This item is still available. But you can't manage your password from here. Today I will show you the easiest way to do this task. Remember: Your Windows should be genuine or it may ask you to activate windows while doing this task. So, if you have any problem regarding activation then visit: Windows 8 Activation Process. Press Start + W > type Password > select Change your password. Or you can simply press the Start button and click on user icon from the top right corner. Then choose Change account picture and choose Users. Both do the same job. Now as you can see in the image below, hit on the Change your password under the sign in option. Click on it to change. Now you can change or create your password from here as you did in earlier versions. You can also set a picture password from here. Do it with caution if you're a beginner! You can also change your password in running condition if forgotten !! Visit here to know more: Change Windows Password if Forgotten. How to Change Windows Password without Knowing it !!! Today I'm gonna write about an amazing trick for you! By this time you've already understood about what I'm talking about. Yes, you can change windows password without knowing it. But PC should be in a running condition! This is a very easy method. If you're new user then you might face some problems. But mid level user can do this within few minutes. But your PC should be in the Administrator mode to do this task. This system has been tested for Windows 8 and 7. But this method may also work on Windows XP. Okay let's start. Open Command prompt as Administrator. XP users don't require Administrative mode. Type the new password and press enter. Retype the password and press enter. If password is changed then you will see the message- the command completed successfully. And don't forget to create a Password Reset Disk to avoid any accident. 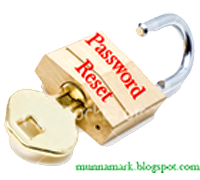 If you have the reset disk you can change your password if forgotten. Also read this post- How to Set a Password on Logon Screen. If you're a regular visitor of this site then you might know that several posts have been made about Windows 8. 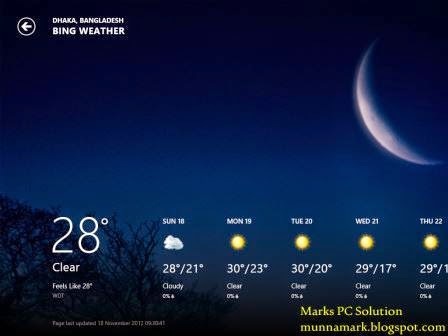 Several times I mentioned about Weather Forecast app of Windows 8. Previously I wrote about Windows Reader. Today I will try to give you a detailed information about Weather app. This app is named as Weather or Bing Weather. And specially made for Windows 8. And it is not readily available for Download. It is bundled with Windows 8. If you're connected to online you can view the world weather through this weather app. It collects information from the server and shows you updates. You can get 10 days weather forecast with historical data. You can also search your desired location and get information of it. This app is very handy to use and easy to navigate. To use this app press the Start Button and click on weather app tile. Immediately it will run full screen. To find a particular city- Click right button of your mouse and then hit on places button from the top. Then hit on + button and type the name of the city and choose it from the list. To see the world weather- Click right button of mouse and choose World Weather. Then click on your desired location in the map and get the necessary information. You can also view the historical data, hourly forecast and 10 days forecast of a particular location by this app. Certainly Google Page Rank or PR is the most effective and reliable way to estimate the value of a website or blog. No other method is as dependable as PR. But recently Alexa Ranking is becoming a popular ranking method. In PR system a site is valued in a scale from 0 to 10. The higher the PR the higher is the rank. In this system thousand of websites might have the same rank. For example, both Google and Facebook's rank is PR 9. But in Alexa Ranking the sites are ranked from 0 to last. The lower the position the higher is the ranking. Though Alexa Ranking is still not as popular as PR even many advertisers are interested in it. And hopefully it will be a popular ranking method in the near future. Today I will tell you about the best effective ways to improve the Alexa Rank of your site. If you follow these methods properly I'm sure you can easily take your site from 10,000,000 to 100,000 within just 1 month! I'm recommending you the following 8 tips. Update your site regularly. I mean write new posts on a regular interval. Otherwise your rank will fall. Create Back Links of your site in those sites which have more traffic. Know More. Insert Alexa Traffic Widget in your site. Know more. Use Alexa Toolbar in your browser when browsing your site. And all tell your friends to visit your site with Alexa Toolbar installed. Marks PC Solution Toolbar can also increase your rank. Know more. Claim your site in Alexa. Know more. Create an Alexa Toolbar for your site. Know more. Place a Review Widget in your site. And write reviews of your site in Alexa. Tell your friends to write reviews of your site. Know more. 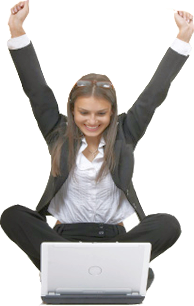 Submit your site in different search engines to increase links. Know more. By this time many of you know that we've a toolbar made using Alexa. But many of you may not be aware of the advantages of this toolbar. This toolbar will help you to directly access your Gmail Inbox when signed in! This is a live toolbar. Whenever anything changes it will also change automatically. If you get new email it will be shown in the button. It will allow you to visit Google, Bing or Yahoo search with a single click! It will show you Alexa ranking of search results in Google. You can easily visit our FB Fan Page by this toolbar. You can also tweet any page if you have this toolbar installed. Most importantly, this toolbar will increase your Web Site ranking if you browse your site with this toolbar installed on your Browser. To get the best result, use this toolbar with Google Chrome. You can on or off this toolbar with single click if used in Chrome. Currently our toolbar supports 3 browsers. It is available for IE, Chrome and Firefox. To avoid any compatibility issue, make sure that you're using the latest version of your browser. Or upgrade it. Place Alexa Review Widget & Boost Your Alexa Ranking! Dear Visitors! Good evening. Hope you're alright. How to Create Custom Alexa Toolbar for a Site? How to Claim a Site in Alexa? Benefits of Using Alexa Toolbar. How to Insert Alexa Traffic Widget in a Site? Writing reviews for a site in Alexa is very essential to increase the traffic rank. Alexa gives importance to that sites which have more reviews. But is it logical that users will find Alexa Review link for your site? Or would they like to search your site in Alexa? Then they will review it? That's very funny. Certainly they will not do it. That's why you should place a Review Widget in your site. So that interested person can easily write a review for your site. Simply copy and paste the following HTML code in your site. You're done! Then go to the layout option. Click Add a Gadget from any suitable place. Copy and paste the following code with proper modification and save it. Now save and view your site! NB: Don't forget to replace the red part of the code with your site url !! If your site is not running by blogger then copy the HTML code and place it at any suitable place. And if you're looking for more customization then visit here. If you like Marks PC Solution then write a review for us! Update: Alexa Review Feature has been retired! Alexa review feature has already been retired. Just visit here. It shows - This feature is no longer supported. Not sure whether it will have an impact on alexa ranking or not. But this is really bad for us. Because we have a good number of positive reviews. I'm gonna post a new topic after a long break. I'm very sorry for those people are looking for new topics. Actually I was not getting new ideas. If someone is looking for a specific content then he might use this option to inform Marks PC Solution. OK let's start our today's concern. This post is specially helpful for blogger users who are trying to set Tabs in their blogs. And many of you may not know that there are two ways for creating tabs. I'm gonna discuss about both the methods one by one. This system is powered by blogger itself. This system allows you to create stand alone pages in your blog. Stand alone means you can only post a single topic in this page. For example, Contact Us or Report Us etc. This system may be less popular but still useful for creating a single but important post. Now click on the Pages button from the left panel. If you didn't create any pages earlier then you will see only Home button. Look at the option Show pages as- Choose Top Tabs. Click on the New Page button to create a new page and choose Blank Page. Remember, when you click on Blank Page from the New Page option immediately it will take to a new page. You should give a name of the page here. You can also write the contents of that page from here or you can just save it and write the contents later. Note: You can also add a web link in the tabs if you choose Web Address instead of Blank Page from the New Page option. Now go to the Layout option from the left panel. Now click on Selected Labels from the show option and hit the edit button. Choose the labels from the box below. Never choose more than 8 or 9. Make sure that they can appear within a single line. Otherwise it may create a 2-line tab. That looks very odd. After selecting the labels hit on Done button and save the gadgets. Now view your blog. Your posts should be labeled properly to appear in the proper tabs. Labels gadget must be place under the header of the blog. Create Automatic Screen Shots of Your Tasks with Steps Recorder! Dear readers! Couple of months ago I wrote about how to create screen shot by snipping tool. Snipping tool is an easy way to capture image or screen of any window. If you're interested to know more about snipping tool then click here. Snipping tool is a manual tool to capture image. But today I will discuss about Steps Recorder which is an automatic tool to capture image or screen. You can use it for different purposes. Say for example, you can use it to make tutorial of something. When are writing about how to do something then you can use this tool to record the process with your written instructions. Steps Recorder is built in with Windows 8. But it was also available in Windows 7 named Problem Steps Recorder. Only the name of this app has been changed everything remain same. Windows 8 users, Press Start and simply type Steps then choose the Steps Recorder. And windows 7 users Press Start + R > type psr > Press Enter. Now do your normal job that will be recorded. Remember, when you click on something it will be recorded. And you will see a red button with every record. Anytime you can pause or resume the recorder. Give a name to the file. The file will be saved with .zip extension. When you open the saved file, it will opened with your browser. And while using this app, you may find many useful tricks. Don't forget to share your ideas with us. Comment below! In this post I'm gonna tell you how can you measure your site's speed. There are several methods. As a standard way, I'm talking about Google Developers. Let's test the speed now. Visit this page- Page Speed. Now type your site's URL in the box (ie. http://munnamark.blogspot.com) and hit the analyze button. The page Marks PC Solution got an overall PageSpeed Score of 95 (out of 100). Try to use compressed images. Try to avoid flash contents if possible. Place Alexa Traffic Widget on Your Site- Get Higher Ranking! And in this post I wanna tell something about Alexa Traffic Widgets. If you're a regular visitor of blogs and websites you might notice some widgets than shows Alexa Traffic Rank of that site. But this widget doesn't only show the ranking of that site. It does something more . . . Guess what? Helps to boost the ranking. How? When someone visit a site and if there is Alexa Widgets, then Alexa got information of that site usage information from this widget. Thus it can increase your rank. Okay, I'm gonna stop the discussion and start the procedure. Visit Alexa Rank Widget page. After pressing the button you will get 3 widgets. You can choose any of them. Copy the HTML code from any of the boxes. And then paste it in your site. Copy any of the above codes and paste it in your site in appropriate place. I'm gonna show you the way for Blogger only. Don't forget to replace the URL http://www.markspcsolution.com with your site's home page URL. A common tendency of bloggers and web masters is to increase their sites' ranking. The most popular ranking system is Google Page Rank. A page is ranked from 0 to 10 in Page Rank system. And another method is getting popularity day by day. Yes, I'm talking about Alexa Traffic Rank. This ranking system still not as popular as Page Rank. But in the future it will be very popular. Couple of days ago I wrote about the importance of using Alexa Toolbar. And today I'm gonna show how to claim a site on Alexa. Definitely, if you claim your site in Alexa, it will give you a higher ranking in return! Okay let's start our mission. At first create an account on Alexa following the normal rules as you usually do. Now follow this link to claim your site. Type your home page URL (ie. http://munnamark.blogspot.com) in the Get Started box and hit on Claim Your Site. Now you will get the sign up option. Choose the Free option. There will be 2 options. Follow any method that is suitable for you. Then hit on Verify button. If you are facing problem to verify then read more about the 2nd option. Sign in to your blog and go to the design. Hit on the Template button from the left panel. Click on Edit HTML and proceed. Paste this ID anywhere in the head section as the image shows below. To find the </Title> press Ctrl+F and type </title> then search. 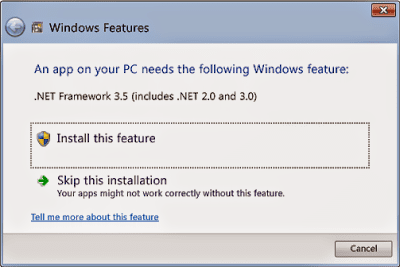 10 Exceptional Features of Windows 8- Upgrade to Enjoy! I've already written more than 3 posts about Windows 8. But all of these were related to preview versions. And I'm writing this post just after installing the Final Version in my PC. Built in Security for your overall PC protection! Built in Reader to view your PDF and XPS files! Live tiles that let you know the latest weather forecast, news updates, sports updates and so many. Touch friendly and drag and drop interface that eases the use of mouse. Don't be afraid. You can also use the keyboard shortcuts for Windows. New apps for view image and video, using camera. New apps for Mail, Messaging and connect with people. You can also integrate your Facebook account with Windows Mail. Great way of multitasking. Quickly switch between the apps. Press Alt+Tab or just move your mouse at the top left corner of the screen to switch the app. New Start Screen! That irritates many users. This is the most important visual change of Windows 8. But if you use this for a week, you will enjoy this. This new start screen will be useful for searching apps, files and settings too. Just press the Start Button and type your query. Immediately you will get the result! Facing problem to view My Computer Icon on Desktop? Click here. This topic might be very useful for those who wanna place AdSense Ad in their websites or blogs. In this post I'm giving you some guidelines that maybe useful for you to get Adsense and to maintain it after getting this. If you carefully follow these guidelines, it will be easier for you to earn some cash from Adsense. Otherwise you may suffer just like me! Regular visitor of this site should know that I've already rejected 4 times from AdSense Program! And waiting to be rejected for the 5th time! Let's start our AdSense concern. AdSense provide a specific set of rules for publishers. You can find it here- AdSense Program Policy. But very few of them read this carefully and consequently they suffer and lose their account. So I will try my best to make the rules clear to you. Let's start. Before Getting AdSense - Be Steady . . . Your site must be easy to navigate. And it should be user friendly. It shouldn't contain any types of illegal, matured, adult or violent contents. It shouldn't redirect users to unwanted websites. It shouldn't contain any copyrighted material. It shouldn't contain any types of hacking, cracking or gambling related contents. It shouldn't contain any pop out ads that bore users. Know More . . .
Don't place any third party Ads (Although AdSense allow this). Your site should have sufficient visitors. But make sure that it doesn't get traffic only from a certain source. And never participate any paid-to-click program to increase your site traffic. And finally try to publish the unique contents that drives more traffic. After Getting AdSense - Be Careful! The very first thing you need to do after getting AdSense is to be careful. Because your AdSense account maybe disabled at any time! Never click your own Ads. And not a single click to test. Never encourage others to click the Ads by any means. Never try to make artificial clicks. Place the Ads in a way so that it does't disturb the visitors. The Ads should be distinguishable from your site's contents. And finally follow all the rules that you did before getting AdSense. If this post is useful for you then please let me know it by your valuable comments.